Juventus dropped points in Serie A for the first time this season as Genoa held them to a 1-1 draw in Turin on Saturday. 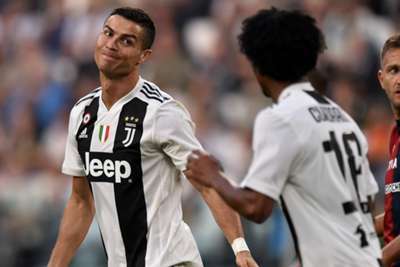 Cristiano Ronaldo's first-half strike was cancelled out by Daniel Bessa as the visitors ended a five-game top-flight losing streak at the Allianz Stadium. The result gives Napoli the chance to close to within four points of Juve at the top of the table and sees their 11-game winning run in all competitive competitions come to an end just three days before they face Manchester United in the Champions League. But Bessa's header rescued a draw after some slack Juve defending and means Massimiliano Allegri's side no longer have a perfect record in 2018-19. Ronaldo looked a threat from the off, forcing Ionut Radu into a good save before rattling the woodwork with a powerful header. He eventually found the net 18 minutes into the game, tapping home from inside the six-yard box after Radu had been wrong-footed by Joao Cancelo's deflected shot. Juve seemed eager to score a second as soon as possible, but struggled to convert their possession into meaningful chances, and Wojciech Szczesny had to be alert to deny Krzysztof Piatek an equaliser from distance. Genoa's growing confidence was rewarded after 67 minutes. Christian Kouame picked up a loose ball when Juve's defence assumed it was going out for a corner, and his cross was met by the unmarked Bessa, who headed home from six yards out. Allegri introduced Paulo Dybala off the bench and both he and Miralem Pjanic fired narrowly wide from distance, but Genoa withstood the late pressure to move into 10th in the table and give Napoli the chance to close the gap to the leaders. Allegri's side had won 11 games in a row in all competitions before Saturday's game, but they have only themselves to blame for failing to claim their ninth Serie A win of the season here. They seemed to become complacent after going ahead and Genoa deserved their equaliser, a goal that means Napoli could close to within four points of the leaders if they beat Udinese. It also offered United a glimpse of vulnerability ahead of Tuesday's tantalising showdown at Old Trafford. Joao Cancelo is improving rapidly in Turin and produced another hugely effective performance. It was his run and shot that led to Ronaldo's opener and he largely stuck to his task well down the right, even as several of his team-mates seemed to switch off. Leonardo Bonucci had not had a great deal of defending to do, but the Juve defence were punished for the bizarre moment when they expected the ball to run out of play in the build-up to Bessa's goal. The Italy centre-back has to take a sizeable portion of the blame, though, as he failed to react in time and could only stand and watch as Bessa ran behind him to meet Kouame's cross. - Juventus have scored more first-half goals than any other team during Serie A this season, while Genoa have conceded more than any other (11) in the same period. - Genoa's starting 11 is their youngest in Serie A this season. - Christian Kouame is the youngest player in Serie A this season to create more than two assists. Juve will now head to the north west of England to prepare for that Champions League showdown with United at Old Trafford. They then travel to Empoli in Serie A next Saturday. Genoa have eight days to prepare for Udinese's visit to the Luigi Ferraris.